The small city of Dubbo, New South Wales, hasn’t seen much crime in its day. But the one crime that has lived with its residents, and continues to leave a bad aftertaste, was the death of local woman Lee Duncan. Her husband, Greg Hopper, was accused of her murder, but managed to escape before being arrested. 27 years after Duncan’s death, her real murderer confesses. His identity surprises everyone: none other than Greg Hopper’s older brother, Ike, owner of Dubbo’s beloved candy shop. With the charges against him dropped, will the elusive Greg now return from his self-imposed exile to the States or Japan or whichever far away land the residents of Dubbo imagine him to be living in? Unsurprisingly, Greg is actually closer home than Dubbo’s citizens realise. 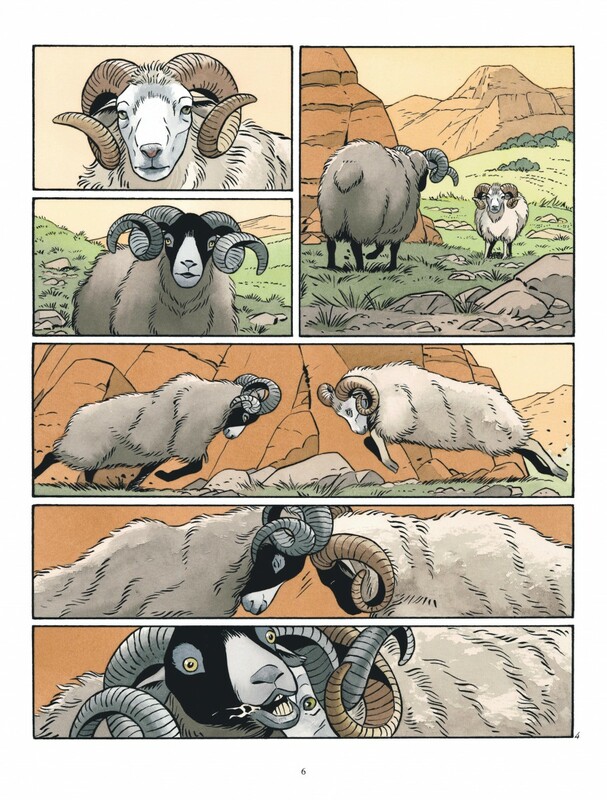 He is living under the name Thomas Wentworth, somewhere in the Outback, a lonely, but content sheep-farmer. Every last Friday of the month, the aptly-named Friday arrives with supplies for Wentworth, along with the latest sports news. On one such Friday, though, he arrives with news of another sort—for Greg Hopper, not Thomas Wentworth. 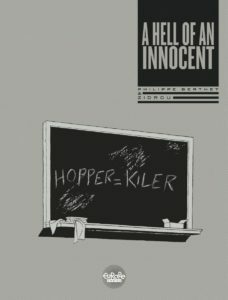 In the magazines Friday found at his dentist’s office, he noticed the familiar face of his friend in news pieces about Ike Hopper’s confession. After much thought, Greg decides to return home, leaving his few worldly possessions to Friday. Not such an innocent Candy Shop now. 27 years is a long time and Dubbo has changed a great deal. The people, though? Not so much. As Greg tries to navigate his newfound freedom, he must also come to terms with what really happened to his wife and the lasting consequences of his brother’s confession. This neo-noir tale is nothing short of evocative. 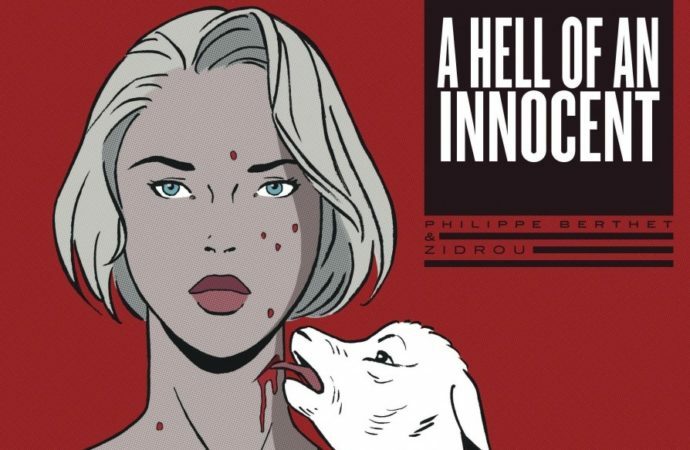 There’s a heavy sense of atmosphere in each panel of A Hell of an Innocent, and the reader cannot mistake the feeling that there is more to the story than we are initially told. The place and time are obvious, not just by the dialogue, but also by the art. 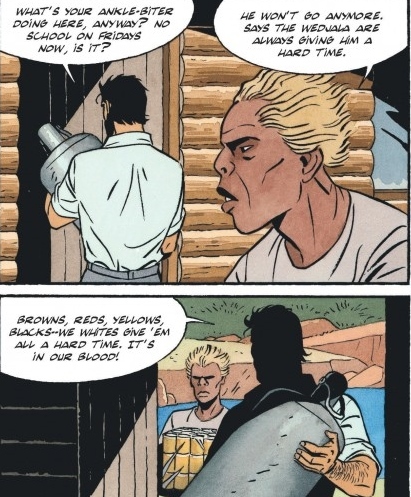 There are several visual markers that make it obvious to the reader that the story is set in the ’70s, which adds to the overall atmosphere of the book. Deceptively simple art that is beautiful to behold. The art by Philippe Berthet is practically three-dimensional. 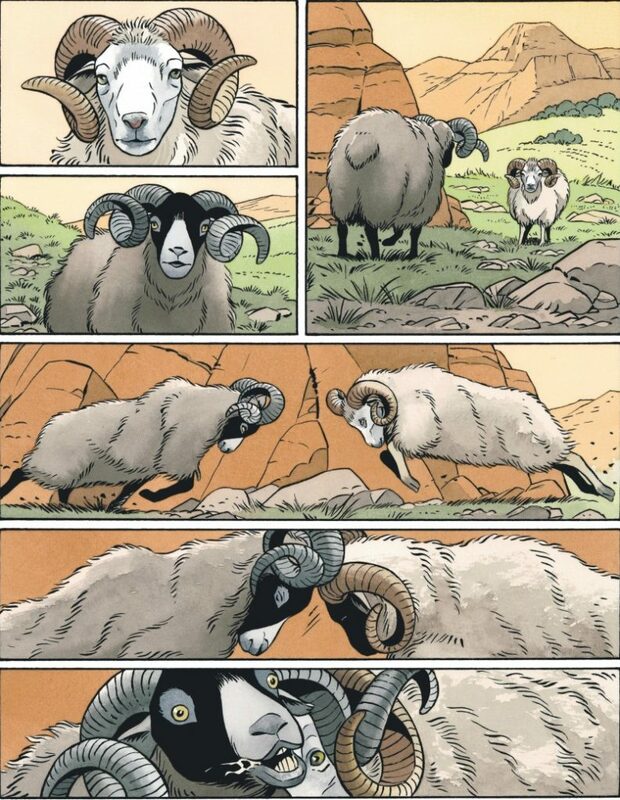 He has a way of imbuing depth in his panels that is incredibly realistic. One often feels like they are standing within the frame of the book, which is quite an exhilarating experience. I wasn’t completely sold on the faces of the characters, which are over-long and a little uncanny. After a few pages, I got used to the style, and it didn’t bother me. I did like that he managed to distinguish the characters from each other despite the stylisation. Though I liked the inclusion of the aboriginal character Friday, and his son, did the writers have to be so on-the-nose about his role by naming him Friday? I understand them wanting to include Robinson Crusoe vibes, but there are racist connotations to Daniel Defoe’s novel that seep into this book just because of this lazy shorthand for Friday’s name. It would have been great if the character was given an actual aboriginal name, which would have given the character more person-hood, instead of limiting him to a trope. Despite this exchange, Friday has no characterisation. On the other hand, the book’s only fat character, Dubbo journalist Olivia Pulitzer, is surprisingly well characterised. She isn’t obviously fat-shamed, and whatever negativity she faces is more because of her profession, which she is extremely good at, rather than the way she looks. It is rare to see fat characters in comics, and rarer still to come across positive representation. The creators do right by Pulitzer, which is great. Where the story falls apart for me is the ending. Up until the final few pages, it was a solid read. We had a mystery that had been solved, lots of interesting characterisation, a protagonist who wasn’t all he seemed ,and then the ending just gives up. The denouement is an obvious cop-out and throws the strong writing in the majority of the book under the bus. What would have helped is if we could have seen something of the dynamic between Greg, Ike, and Lee. Ike gets barely any characterisation, barring his narration, and whatever little we learn from his wife and daughter. Greg’s motivations are simmering under the surface throughout, with all signs pointing to a grand reveal at the end that never materialises. As for Lee, she is framed entirely by Greg’s memories of her and his “visions” of his dead wife talking to him. Who was she really? We can never know, especially since Greg is not the most reliable of narrators. Lee’s lack of agency is a misstep; there are already numerous noir stories of femme fatales whose murders are the only interesting thing about them. How much more subversive, and contemporary, would it have been for the roles of Greg and Lee to be swapped or for the murdered woman to enjoy more of the spotlight? There is still a dearth of women’s stories out there. 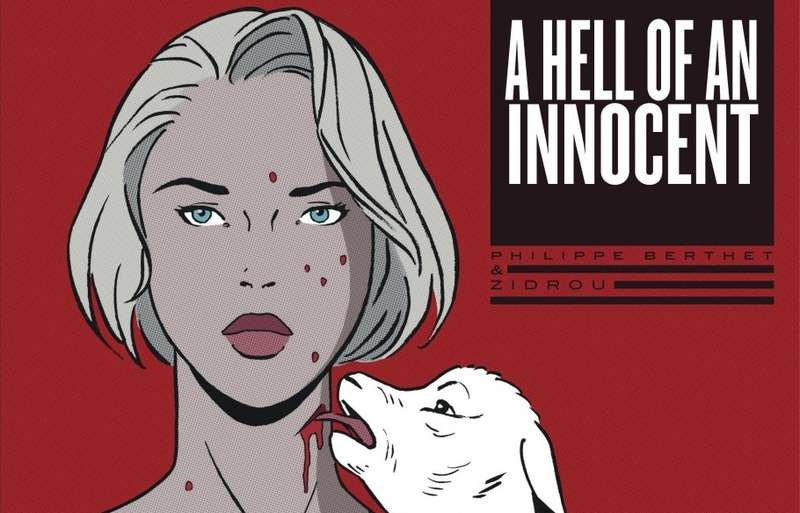 Had the ending of A Hell of an Innocent been more than just a male power fantasy, it would have been a much better read. Despite its excellent art and strong plotting, this vital mistake leaves the reader feeling underwhelmed. One wonders how the story would have turned out in the hands of non-male writers. 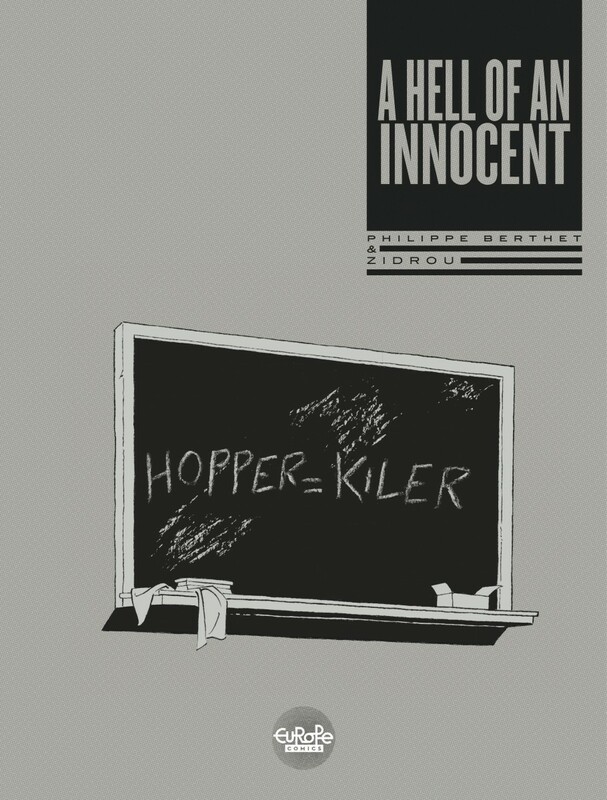 Having said that, A Hell of an Innocent still manages to be an absorbing and immersive read. Two-thirds of the book are gripping and beautiful. The ending, though rushed and predictable, still has impact and will leave the reader pondering what they have witnessed.